Whether your Austin travels bring you to the music, films, and tech at South by Southwest, the quest for the perfect taco in the town’s many restaurants, or anything in between, Austin Charter Bus Company can streamline your travel plans. Explore all the things that “keep Austin weird” in your own private bus! The buses in our network range from charter buses that can accommodate 56-passengers to compact 18-passenger minibuses that can zip around the city streets with ease. You can even upgrade your ride with amenities like panoramic windows, on-board restrooms, WiFi, power outlets, televisions with DVD players, and much more. Our team of transportation experts will gladly pair you with the perfect bus for your private adventures in Austin. Call 512-215-4891 to schedule your custom bus rental today! 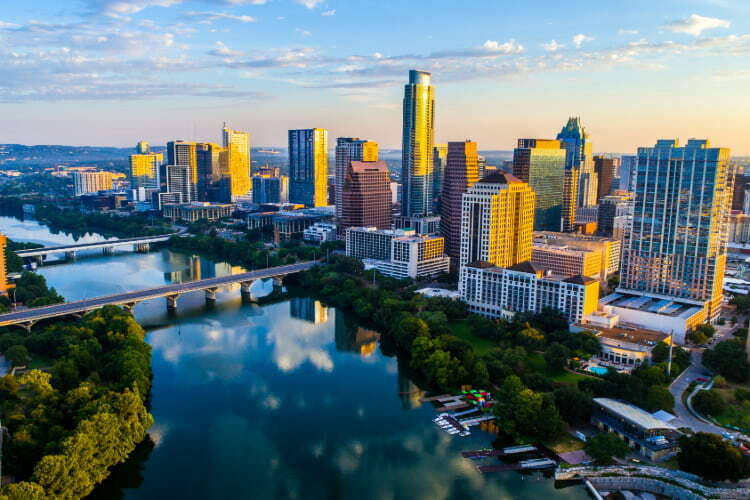 Home to countless restaurants, a thriving music industry, and a sense of quirky southern charm, Austin is acclaimed as one of the biggest cultural centers in the state of Texas. The town is filled with a mix of upstart musicians, techies, film pros, and foodies, so there’s always something to mark on your calendar. Jam along to the rising stars of Austin City Limits or Texas’ best bluegrass at Old Settler’s Music Festival. Cinema lovers shouldn’t pass up the chance to see the up-and-coming horror, sci-fi, fantasy and overall fantastic films at Fantastic Fest, nor should foodies overlook the relaxed atmosphere of the Austin Food + Wine Festival. Regardless of the reason you’re in town, you won’t want to miss a single second of these festivities. With a private bus transportation plan from Austin Charter Bus Company, you won’t have to! We simplify festival transportation for vendors, presenters, and visitors alike and can drop you off at the entrance. Whether you’re a presenter with exhibit materials in tow or an attendee needing to stash your merchandise between venues, you should take advantage of your bus’s roomy overhead storage bins and luggage compartments. You can safely secure your belongings in the coach with your professional driver, even while you’re walking around the event. If you need a getaway from the city, we can get you there. With a private bus rental from Austin Charter Bus Company, it has never been easier to take a day trip to visit the Alamo and stroll along the beautiful San Antonio Riverwalk. 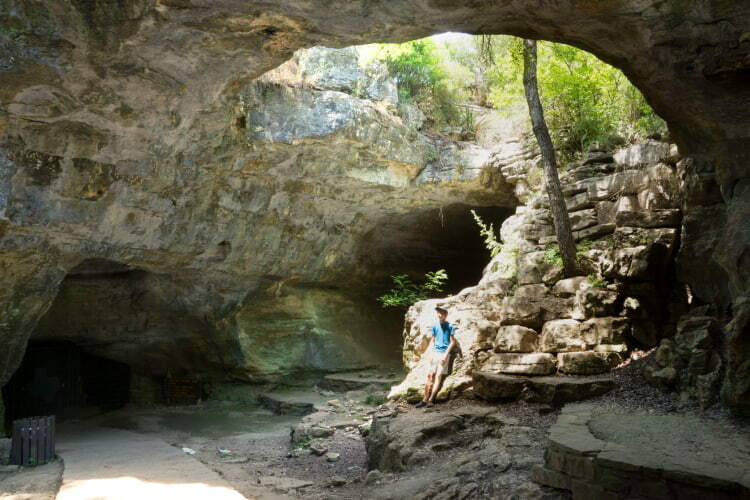 Nature lovers can take advantage of Texas Hill Country scenery by exploring the history of Enchanted Rock State Natural Area or the mysterious cave systems of Longhorn Caverns State Park. For a taste of southern hospitality, drive 45 minutes southwest from Austin’s city center to Wimberly. There you can wander through the thrift stores and quaint cafes, or take some selfies in front of the 50 giant decorated boots scattered across town. No matter where you plan to roam, our 24/7 team of specialists can find the perfect fit for your day trip. Rent a minibus for a small group of up to 25, a charter bus for larger groups, or a combination of the two to accommodate groups of any size. In as little as 2 hours, we can assemble a fleet tailored to your excursionists’ size, preferences, and agenda. Call 512-215-4891 today get started! A vibrant and youthful city, Austin offers educational and recreational activities for travelers of all ages. Planning a field trip for your daycare students and staff? Bus everyone to the Austin Aquarium for a day of aquatic education. Faith-based youth groups can volunteer at one of the city’s food banks or help keep Austin’s many green spaces clean. If you’re in town between March and October, take your little ones to the Ann W. Richards Congress Avenue Bridge at sundown. Spectators young and old will marvel at nearly 1.5 million Mexican Free-Tailed bats that emerge from under the bridge and fly away into the Austin sunset. No matter what adventures you have in store, ensure your group of children, tweens, and teens arrive at their destination in a custom motorcoach equipped with the latest safety features. Drivers in our network must pass necessary background checks and have a spotless driving record, so you can trust these certified professionals to transport your precious cargo. When family comes to town, you’ll want to make sure their visit is relaxing and stress-free. One way to ensure their comfort is to plan the transportation logistics before everyone gets together. Arranging carpools and rideshares can be tedious and time-consuming, and finding enough vehicles to accommodate large families can be nearly impossible. Combined with the hassles of handling navigation, parking, and pick-up times, transportation woes can take up the precious time you’d otherwise be spending with family. So why not invest in a private bus rental for your family reunion or vacation? With one call to Austin Charter Bus Company, we can help you coordinate all the transportation details for your family trip. Whether your relatives need a lift to the Austin-Bergstrom International Airport or a ride from Austin to Houston, Dallas, or Corpus Christi, we’ll pick you up curbside and get your family going! Your loved ones will arrive refreshed and ready to go with amenities like on-board WiFi, power outlets, reclining seats, or any of the upgrades available for buses in our network. If you’re unsure where to start, look through the fleet of potential buses to help you decide which option is best for your private bus transportation to your family reunion. Whether you need a fleet of charter buses to cross state lines, a minibus shuttle across town, or any combination of transportation solutions, Austin Charter Bus Company can arrange the right rental plan for your trip. One of our expert reservation specialists will connect you with your customized private bus rental when you call 512-215-4891. Call today for a free quote!